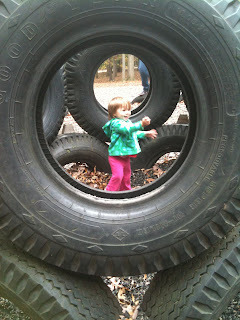 This weekend we visited the Tire Park playground in the Patapsco State Park's Hilton Area. Located in Catonsville just off of Hilton Road, this playground is made almost entirley out of recycled tires. The play equipment is tires, the swings are tires even the ground is coverd with rubber tire mulch! We have actually been to this playground before and the Bee and Bean love it but it is really a great playground for kids of all ages. Since the playground is in the state park you do have to pay a $2 per adult (kids are free) fee to enter the park, but the money goes to supporting the park, and believe me this playground is worth it! Once you enter the park there are several parking lots around the playground. The playground itself is pretty large, there is a wooden climber, with a large metal slide and bridge but the rest of the playground is made from tires. There are tire climbers, tire choo choo train, tire balance beams and even tire tunnels. The whole playground is wooded and so while we went on a nice fall day, the shade probably keeps the playground relatively cool even in the summer. There are also many pavilions around the playground that can be rented for parties, and a convenient bathroom right near the playground. The Bee spent most of her time walking on the balancing tires while the Bean, who has no fear, spent most of her time repeatedly going down the large slide! Definitely a fun and different playground, great for all ages! The playground itself is pretty large, there is a wooden climber, with a large metal slide and bridge but the rest of the playground is made from tires.